Here on the Homestead, we try to make as many of our own goods as possible. This is true for things like food, furniture, and even toys for the kids. I’m going to walk you through the process of a play kitchen I made for Sparrow’s birthday. Before I begin, I want to talk a little bit about why we choose to embark on crazy projects. One reason is, I have very high standards for the things I use on a daily basis, and the only way to make sure those expectations are met is by building them myself. By creating something myself, I don’t have to trust a manufacturer to make sure an item is going to function correctly. Also, I want my kids to grow up understanding that building something from scratch is not only possible, but also a whole lot of fun. This kind of thinking can spark their imagination in important ways, and I want them to experience the meaning derived from creating something instead of just buying it. I decided to make the play kitchen for my kids because I know how much they enjoy cooking with Eve in the kitchen. I knew this would be a fun way for them to get involved and excited about cooking for their own families someday, plus I knew I would have a lot of fun building it for them. The kitchen is made mostly of pine. I always have excess scraps laying around my shop and it worked out that I had just enough to use for this project. 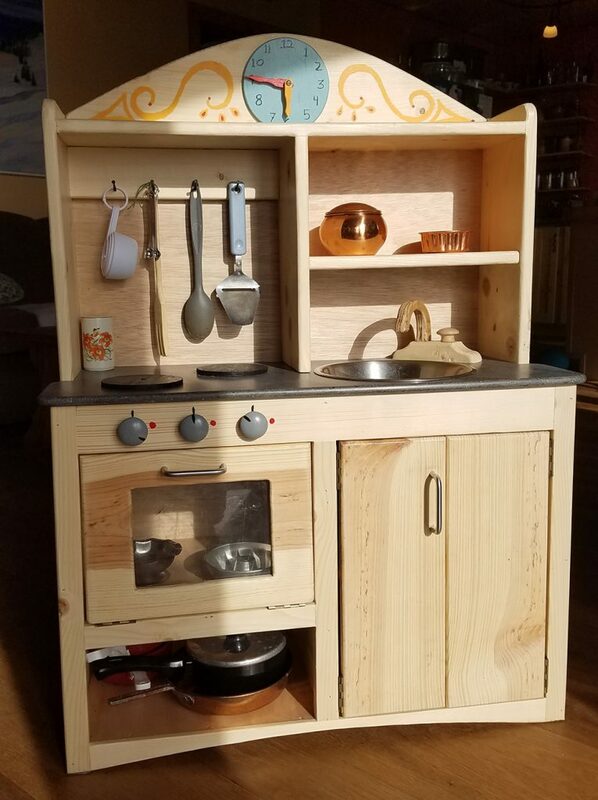 Most of the play kitchens you can buy today are made of some type of plastic which doesn’t hold up as well as the pine I decided to use, and I want the kids to be able to play with this kitchen for years and years to come. Another part of the play kitchen, as you will notice, is a little clock that I made and hand painted. The kids love the clock and it has actually taught them a lot about telling time. When our son, Findlay asks me “What time is it right now?” we go together and set his kitchen clock. If anything, this is a foundational step for him that will help him when it comes to telling time later on. I really enjoy seeing him learn. The countertop used for the play kitchen is a piece of solid surface countertop that I got it from a friend of mine who lives down the road and is a countertop specialist. The countertop is a super dense material that is used in normal residential kitchens. I wanted the materials to be authentic and to last. Once the countertop was installed, I simply cut a hole in the top for a sink. Next, I cut out and painted a couple pieces of plywood black to look like stove top burners. They turned out great. I loved this project because it helped me connect with Findlay and Sparrow on a deeper level. This was a fun project where I was able to use my skill set and apply to it something that they would really enjoy. It brings back memories of when I was a kid and had toys that men in my family created for me in their workshops. Every parent wants to give their kids toys they will use and enjoy. For me personally, it’s rewarding when I can give them what they want, and show them that I made it with my own hands. I think we both get more out of the experience this way. As you can see, I had a lot of fun with this project and it didn’t take me long. 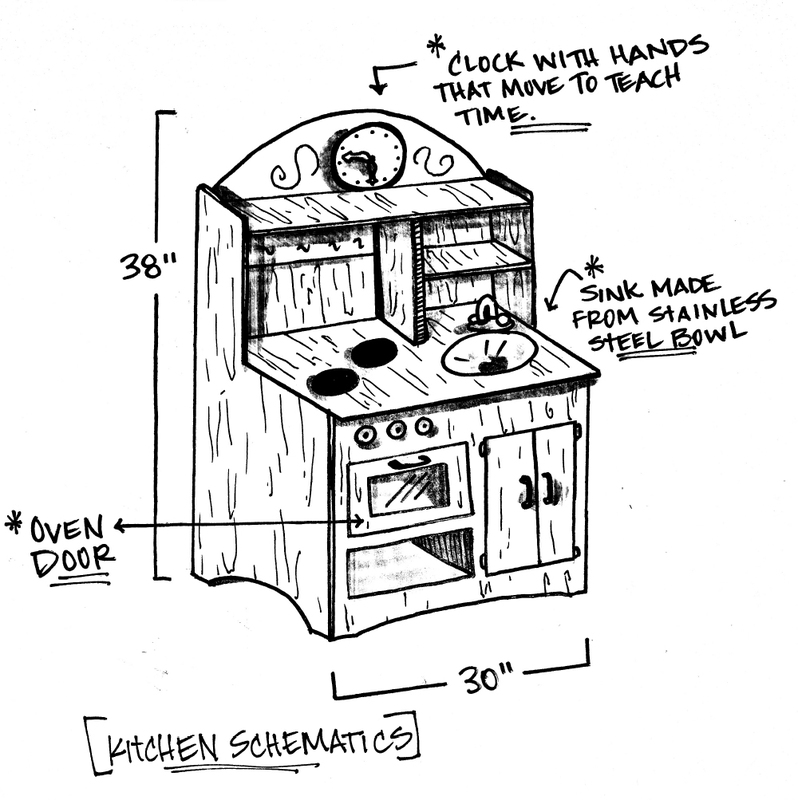 If you are interested in doing something similar, you can see a rough sketch of the kitchen that I built and you can begin gathering materials that you have handy to construct something similar for your children. Part of the Homesteading Mindset is using the resources that you have and repurposing them to make something new. It doesn’t need to cost a lot of money. I am excited to see how you can use the Homesteading Mindset to become resourceful and find ways to take my version of this toy kitchen and put your particular spin and style on it. I know this is something that you can do for your own family, no matter where you are! I look forward to seeing what you come up with. Maybe this will be something that will be passed down for generations in your family, just like I hope it does in mine. Have fun, be creative, and enjoy building something for your kids that may last their lifetime. Eivin has created some amazing things in his workshop over the years, and he is now sharing them with you! Sign up below if you'd like to know when Eivin shares a new plan from his workshop!